Marbella´s Golden Mile is not actually a mile, it is, as one would rightly expect of Marbella, much bigger! At four miles (6.4 km) in length, the Golden Mile starts at the western limit of the glamourous beachside town and runs along the coast as far as the Spanish luxury resort, Puerto Banús. Back-dropped by Marbella´s own micro-climate inducing, beautiful mountain, La Concha, the Golden Mile is traditionally known as the most exclusive zones on the Costa del Sol and boasts some of the region's most spectacular villas and developments. Property for sale on the Golden Mile is highly sought after by film-stars, wealthy business owners, sportsmen and women, as well as international royalty and the elite of European society. Geographically, the Golden Mile can be divided into two parts, North and South, divided by the majestically named Bulevar Principe Alfonso von Hohenlohe. Prince Alfonso Maximiliano Von Hohenlohe-Langenburg was the businessman who put Marbella on the map as a high end resort. He founded the Marbella Club Hotel and promoted the area to his rich and famous friends, snapping up huge tracts of land. The area is now synonymous with the high-end luxury lifestyle, and offers developments which have evolved in parallel with Marbella Club and Puente Romano Hotels whose mottos are "only the finest will do". Prince Alfonso´s influence is still reflected on either side of the Golden Mile by the ultra-exclusive designer villas, luxury apartments and beachfront townhouses, all of which attract both national and international buyers seeking a piece of real estate heaven. These luxury properties include every amenity one could wish for such as private outdoor bars, swimming pools, cinema rooms, beautifully manicured tropical gardens, saunas, Jacuzzis, gyms, and personalised concierge services. Dotted along the Golden Mile are five-star hotels, business centres, award winning restaurants and many other services. The beachside on the South is fully developed and the developments in this area include Alhambra del Mar, La Alcazaba, Las Torres, Los Verdiales, Marina Marbella, and Oasis. These properties are extremely sought after, given their prime beachfront locations, and snapped up as quickly. The area is a very popular location to spend long summer evenings looking out onto a calm Mediterranean Sea whilst enjoying the wide choice of restaurants, bars, and cafes along the stretch which runs right next to some of the best sandy beaches on the coast. On the Northern side, there is still room for development; here you can find impressive constructions, in Nagüeles, Sierra Blanca, Cascada de Camoján, Jardines Colgantes, Marbella Hill Club & Casas del Señorio de Marbella. These areas are considered to be just as much part of the Golden Mile as their beachside counterparts. 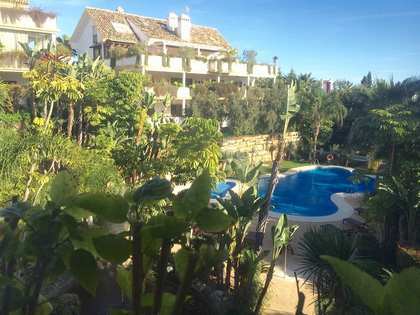 Nagüeles is at the foot of La Concha Mountain with large plots housing many spacious villas and luxury apartments just five minutes’ drive to Marbella centre. Given it´s elevated position, amazing panoramic views are possible for peace lovers on varying budgets. Sierra Blanca and Cascada de Camoján are two more areas which are havens for the wealthy and well known seeking tranquillity. 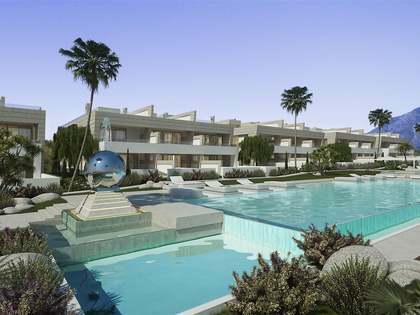 Villas in the exclusive Marbella community of Camoján require budgets of 2 million euros and over. Architects of the mansions in these areas have designed the most luxurious of living spaces for the most demanding of clients. Much more peaceful than the Golden Mile per se, you can get breath-taking coastal views and you are just a stone´s throw from Marbella and Puerto Banus. The northern area of the Golden Mile also houses one of the top international schools on the coast. At the west end of the Golden Mile, the world-famous resort of Puerto Banus can be found. Renowned for its luxury life style, top brands, cars and super-yachts, this is a place to spend serious money. There are few places in the world where you can see so many amazing cars driving past, filled with so many beautiful people. Award winning restaurants look on to the harbour and top end yachts and designer shops that even Prince Alfonso von Hohenlohe would approve of. If you are looking at property for sale in Puerto Banus, you will find resale properties in a prime location with a price tag to match. Lucas Fox offers a wide range of Marbella luxury real estate for sale on the Golden Mile and in the centre of Marbella, including spectacular family homes with large gardens and private swimming pools, and exclusive apartments situated in prestigious developments with excellent facilities. Contact us today to get your dream luxury property on the Golden Mile.